Normally I don’t like romance novels, but Autoboyography pulled me in because it was about a boy in a writing class. I did like it in the end. 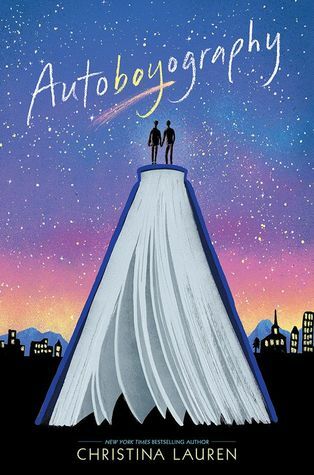 I give Autoboyography by Christina Lauren four out of five hearts because it was a very touching story and it gave me a new view on a few things I had no knowledge about. To be honest I did find it very sweet and how fast Tanner falls for Sebastian is (in my eyes) odd. But it is very well written. I really liked the problems the Mormon community causes for the story. I have know knowledge about the Mormons and was very interested in this aspect of Autoboyography. Tanner is an out and proud gay, but he struggles with being back in the closet. It is interesting to see what this does to him and I thought it was very realistically presented. He is a cute boy and a great student. When he in the end decides to rather give up his good grades in exchange to not delivering his novel to his teacher my mouth fell open. It felt so personal and vulnerable. Sebastian is a confused boy. His religion keeps him stuck and during most of the book he actually let it happen. I can’t imagine the inner struggle that would cause. Overall I think Autoboyography is super cute and an easy read. The language used it easy to digest and with Tanner’s relaxed approach to school compared to Autumn’s is great. The two have a great connection and when Sebastian comes into their lives it becomes even more fun. Even when you don’t like romance novels Autoboyography might still be a good read for you. But you will have to read through all the sweet bits. This entry was posted in Book Review and tagged Book Review, Christina Lauren, Contemporary, Drama, LGBT, Romance. Bookmark the permalink.